Anemia is a common complication of advanced chronic kidney disease (CKD) and end-stage renal disease (ESRD), and anemia management is a critical element of care for these patients. In addition to erythropoeitin deficiency and resistance, there is a high prevalence of iron deficiency in the CKD population. This is related to excess blood losses, particularly in patients on long-term hemodialysis who require frequent cannulation and may lose blood through dialysis lines, lab draws, and clotted filters as well as unrelated losses from gastrointestinal bleeding. In addition to blood loss, there is also poor utilization of oral iron with decreased iron absorption mediated by hepcidin and other factors. 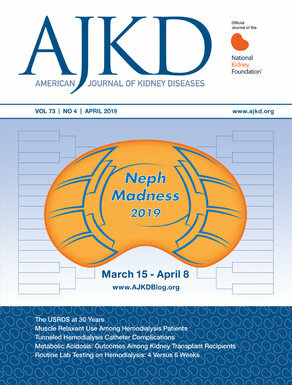 A recent article by Ratcliffe et al summarizes updates to guidelines by the National Institute for Health and Care Excellence (NICE) in the United Kingdom for management of iron deficiency in adult and pediatric patients with CKD and ESRD. The guidelines take into account various testing modalities to assess for iron deficiency and management strategies for iron administration, including efficacy, safety, cost, and ease of administration. The gold standard for assessing iron stores is a bone marrow biopsy, but this is not feasible as a routine diagnostic test. Percentage of hypochromic red cells (>6% hypochromic) is another assessment of iron deficiency, with reticulocyte hemoglobin content proposed as an alternative. Unfortunately, these tests are not always available and require processing of the sample within 6 hours, which may not be feasible for many free-standing dialysis units. They will also be unreliable in patients with thalassemia or thalassemia trait. The combination of ferritin <100 ng/L and transferrin saturation <20% is an option if the red cell assessments are not feasible. Changing the ferritin value for iron deficiency has a dramatic impact on specificity, and use of a higher cutoff carries a risk of exposing patients to iron overload. Use of either ferritin or transferrin saturation alone is not advised. With regard to treatment, the modality of choice varies with regard to the patient’s status (adult or pediatric, CKD or ESRD on hemodialysis) and patient preferences. For most patients either on hemodialysis or receiving treatment with erythropoiesis-stimulating agents (ESAs), parenteral iron is preferred, either at low frequent doses for patients on routine hemodialysis, or at higher less-frequent doses for patients not on hemodialysis. Consideration needs to be given to potential infusion reactions, particularly anaphylaxis. Although oral iron is often inadequate, a trial of oral therapy is advised for patients with CKD not receiving ESAs or for patients who refuse parenteral therapy. Treatment of iron deficiency will require both a correction phase, with higher dose iron administration, followed by a lower dose maintenance phase. Anemia management remains complicated and it is clear that there is not a “one size fits all” strategy. The NICE guidelines take into account cost factors, patient-related factors, and adverse effects. There are different strategies proposed based on the presence of CKD or ESRD and also whether the patients are already receiving ESAs. Although potentially logistically challenging for some facilities, the emphasis on red cell iron content as a marker of total body iron stores appears to offer some advantages over other testing strategies and is a potential step forward in iron deficiency assessment.